Virginia Beach Rotary Club members and nearly a hundred guests met at the Crowne Plaza for the 2018 Annual Scholars Recognition Dinner meeting. The guests included John Broderick – President of ODU, Dr. Aaron Spence – VBCPS Superintendent, Council Lady Rosemary Wilson – former Club member, Jim Spore – former City Manager and current President of Reinvent Hampton Roads, and senior leadership staff from VBCPS, high school principals, Gifted Programs staff, the 2018 awardees and finalists, the 2019 class of “Baby Brickells,” and their families. President Linda began the meeting with a welcome, a blessing, and then led us in the Pledge of Allegiance. Following dinner, Dan Edwards served as the Master of Ceremonies and invited Mike Summers to introduce the Keynote Speaker. Mike then introduced John Broderick, the 8th President of Old Dominion University. John spoke to the attendees about the importance of believing that one person can make a difference in the world, becoming a leader, and leadership qualities and tips. Dan Edwards then introduced Dr. Spence, who described the origin and purpose of the Richard A. Schlimgen Student Leadership Memorial Scholarship. He then described the incredible accomplishments of the 2018 awardee, Abby Ramsay from Bayside High School. Next Dan Edwards talked about the origin and purpose of the Jim Spore Community Service Scholarship and asked Jim Spore to announce the winner. Jim talked about the large number of qualified applicants and then announced the winner as Robert Tillman, IV from Tallwood High School. Dan Edwards then recognized the 2018 Brickell Scholarship finalists that were asked to join us this evening. Each stood and was recognized. 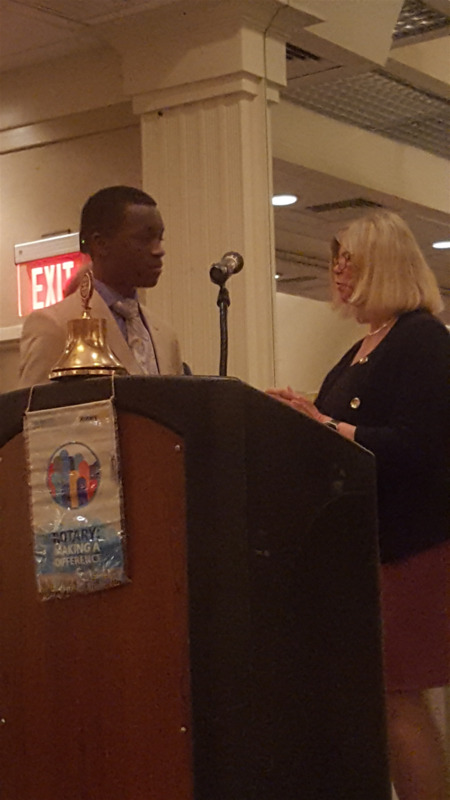 Dan then announced the winner, Curtis Brown, Jr. from Green Run High School and asked Rosemary Wilson to read a proclamation from Mayor Jones. It essentially captured the young man’s incredible list of accomplishments and made May 17, 2018 Curtis Brown, Jr. day for the City of Virginia Beach. Mr. Brown then gave an acceptance speech that spoke to adversity and how one overcomes it can make a person who they are today. He spoke of his person challenges in younger grades that make him the young man he is today. Dan Edwards then invited Dr. Spence back to the stage and read the list of the 2019 “Baby Brickells” that have been selected from the school district. Each junior came forward to accept a special memento for their selection. In closing, Dan Edwards thanked everyone that help make this year’s event a success. Linda Griffin ended the meeting at 7:40 pm with the 4-Way Pledge.